"Very dark, deep, black-hued ruby-red colour with purple hues. This is elegantly concentrated with a deep core of spicy red plum and redcurrant fruit aromas, unfolding to reveal black berry fruits, herbs and earth, and some fragrant oak lift. Medium-bodied, this is beautifully elegant in proportion with a subtly succulent and rich core of plum, redcurrant and black berry fruits. The fruit richness is supported by fine-grained, supple tannins in the background and lacy acidity. The mouthfeel has energy and lively, bright fruit linearity with savoury earth elements and spicy, cedary oak emerging to provide interest. The flavours carry through to a long and refined finish with spice and black fruit notes. This is a very elegant and supple Merlot-blend with refined richness and vitality." 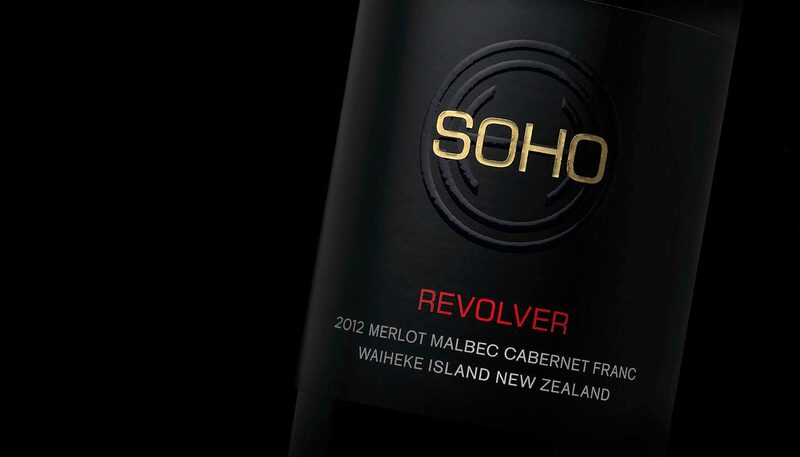 Seductive and rich, Revolver 2012 is a layered blend of Merlot, Malbec, Cabernet Franc & Cabernet Sauvignon, from the clay soils of Waiheke Island & caressed with fine French oak tannins. A floral perfume parades over layers of rich dark chocolate, winter berries and red stone fruits, with a whisp of violet and a herbal thread. Texture builds & thrusts up into the palate – a fully loaded Bordeaux blend.